Vital Face and Vein offers minimally invasive non-surgical varicose vein treatments for huge varicose veins to tiny facial veins. Bulging leg veins are often referred to as ‘ugly leg veins’ as the appearance may be distressing and cause feelings of self-consciousness. We are committed to achieving the best possible results for our patients. Following treatment your legs will look and feel better. We use the Cool Touch and Bios Laser technologies to treat unwanted leg veins. Our experienced doctor will examine your legs and perform an ultrasound scan of your veins. The doctor will advise and provide guidance as to the best treatment for your leg veins. Dr Lorraine Smith is a member of the prestigious Australasian College of Phlebology (ACP), a qualified sclerotherapist and is certified in ultrasound in Phlebology by the ACP. Dr Lorraine has recently been awarded the highly regarded Diploma of Phlebology by the ACP at the International Union of Phlebology UICP conference in Melbourne where the latest techniques in vein treatments were presented. In addition Dr Lorraine Smith is credentialed in advanced vein procedures by the NZ Society of Procedural Phlebology and holds the certificate of Interventional Phlebology from the Australasian College Aesthetic Medicine. THE FIRST STEP IS AN ultrasound examination of your legs to identify the underlying cause and source of the varicose veins. Decisions on treatment are based on the result of the scan which your doctor will explain to you. Treatment is very safe and simple. The endovenous laser treats the vein from the inside to shut it down with virtually 100% immediate success. To understand the treatment process in more detail, watch our video. Endovenous laser is the modern comprehensive and effective solution to treat varicose veins. At Wellington Vital Face and Vein following laser ablation, we remove the varicose veins at the skin surface using injections known as sclerotherapy. At the end of treatment, your legs will look and feel better. Varicose veins procedures are covered by most insurance companies including Sovereign, Unimed, Accuro and Southern Cross. ‘We are an affiliated provider to Southern Cross Healthcare. Full vein assessment costs just $165! Varicose veins result when the one-way valves in the vein fail and the vein wall becomes diseased. Blood is carried away from the heart by arteries and back to the heart by veins. The heart pumps the blood downward to the feet but it is the contraction of the leg muscles that pumps the blood back upward to the heart. The primary leg muscle responsible for the pumping blood back to the heart is the calf muscle. Each time the calf muscle contracts, blood is pushed upward through veins past one-way valves. The one-way valves prevent the back flow or reflux of blood back down the legs in between muscular contractions. Failure of these valves causes varicose veins. The vein most likely to fail is the great saphenous vein which runs from the groin to the ankle along the inside of the leg. The great saphenous contains several one way valves that facilitate the return of blood back to the heart. The resulting increased pressure is transmitted into the branches of the great saphenous vein and varicose veins are the result. If the Great saphenous vein has failed this must be treated in order to effectively treat the visible varicose veins. Varicose veins are very common affecting 60% of woman and 40% of men at some stage in their life. Varicose veins have multiple causes but in many cases, they are an inherited disorder. If one parent has varicose veins, the chance you will have them is about 60%. If both parents have varicose veins, the chance you will have them approaches 90%. Varicose vein disease is a medical condition that commonly causes symptoms that include leg pain and swelling, leg cramps, and restless legs. The bulging leg veins are often referred to as ugly leg veins’ as the appearance may be distressing and cause the patient to feel self -conscious about their varicose veins. Varicose vein disease is a medical condition that commonly causes symptoms that include leg pain and swelling, leg cramps, and restless legs. The leg pain is typically worsened with prolonged sitting and standing and improved with movement and leg elevation. Conversely and somewhat ironically some patients report worse leg cramps and increasing symptoms of restless legs at night. Lower extremity venous insufficiency (valve failure) is progressive if not treated effectively. The symptoms can progress from pain and swelling to skin discoloration and skin ulceration. 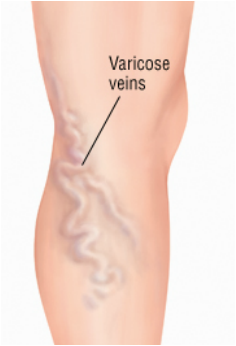 Varicose leg veins increase the risk of deep vein thrombosis. An important thing to understand about varicose disease is that the varicose veins seen at the skin surface are a sign of an abnormality in a vein that can’t be seen (most commonly the great saphenous vein). An ultrasound exam is needed to identify the underlying cause and source of the varicose veins. If varicose veins are simply removed without treating their underlying source, they will rapidly re-occur or new ones will develop.At Wellington based Vital Face and Vein we always perform an ultrasound scan of your veins before any treatment decisions are made. Even bad leg veins can be very successfully treated at Wellington Vital Face and Vein. Venous ulcers are areas of skin that have broken down as a result of varicose disease. Varicose ulcers are very effectively treated at Vital Face and Vein with a combination of endovenous laser ablation and ultrasound guided sclerotherapy. The varicose veins that are causing the venous ulcer are mapped out with an ultrasound exam. The varicose veins are then eradicated with a combination of endovenous laser and ultrasound guided sclerotherapy. Venous ulcers then typically heal within 4 to 8 weeks and they rarely recur. Patients wear compression stockings until the venous ulcer fully heals. The most conservative option used to treat varicose veins is compression stockings, unfortunately, they are hard to put on and uncomfortable to wear so they are not an acceptable solution for most people with varicose leg veins. Compression hose work by pressing on the dilated veins, speeding the flow of blood out of the legs which relieve symptoms of varicose veins. The most comprehensive and effective solution to treat varicose veins is endovenous laser which shuts down the underlying source of the varicose vein. At Wellington Vital Face and Vein following laser ablation, we remove the varicose veins at the skin surface using injections known as sclerotherapy.